Ronnie was outstanding! He picked up the phone every time I called - and answered all my texts promptly. He showed up exactly when he said he would. His work is excellent - he definitely knows his trade. And his prices are extremely competitive. I have no hesitation in recommending him for any electrical work! I asked God to find me a good electrician, HE DID. Ronnie replaced an outside security light. He was on time, pleasant, cleaned up & took away the old light. He set the light control for me and offered to come back if I had any trouble with the settings. There is not anything he could have done to make this a better experience. I would NOT use anyone else but Ronnie. Ronnie is fantastic! We had him install a ceiling fan for us and glad we did! He went above and beyond and noticed that the box that we had that was holding a light, wouldn't have been sturdy enough to hold the fan. He went out of his way to make sure the job was done right instead of cutting corners. I would highly recommend him for any electrical needs. Ronnie Jones installed a ceiling fan on my back patio. Arrived promptly and did an excellent job. Even disposed of all the trash. Will definitely call him if I need more electrical work in the future. Very reasonably priced also. Call him for a quote! My husband Bruce and I, were so pleased with the workmanship of Ronnie Jones, with Cross Texas Electric. He came over, the day we talked on the phone and looked at the situation we were in. With our exposed wiring and fried panel in our bedroom closet, & with no air, to boot! . He called that day and found out, what all it was going to take to make this happen, as soon as possible. I have COPD and cannot take the heat.. Since we had an older model. He had to get a whole new housing for the panel. Well, I may be wrong on these names, but Ronnie knew what he was doing and I really appreciated his confidence, honesty, integrity, workmanship, and clean up, on this job. His kindness and honesty, is refreshing, I wish he was running for President! :D Just Kiddin' folks, but Really. He and Miranda Jones, have a wonderful business here in the Kyle Area, We are in Buda, and will call you, again. Thanks Ronnie and Cross Texas Electric, for a job well done and at a great price, as well. I would definitely hire you again and would love to encourage others, to follow my lead. I am the Director of Environmental Services for San Marcos Rehab. 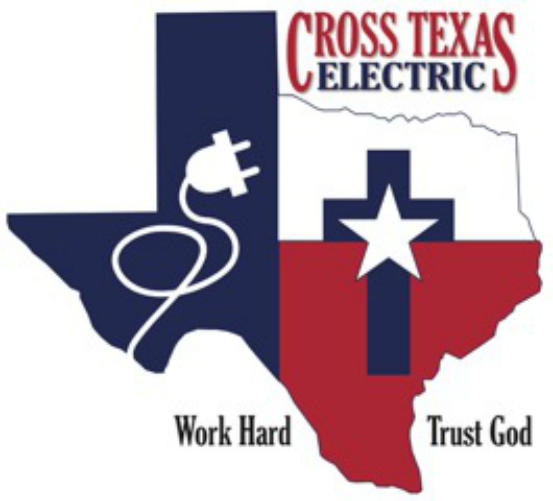 We have used Cross Texas Electric for several projects at our facility and have been pleased. Ronnie Jones is professional, courteous, and efficient. Having any vendors come into a Long Term Care facility can be stressful but Ronnie handled it great and respected the Residents. Ronnie did some work for me at my Body Shop. I found him prompt, honest, and concerned with the quality and safety of his workmanship. I plan to use him again on future projects. We added 1200 sq. ft to our home and Ronnie Jones made the electrical additions an easy process. He changed our service panel to 400 amps and ran all electric, surround sound , hvac wiring, attic lights and more. He was fast, friendly and efficient and made turning a older ranch house into a uncomplicated process. We even had him add can lights in our kitchen in the older part of the house. I would highly recommend him and will call him to do all our work in the future.